Directed by Jane Campion (‘The Piano’ (1993)), ‘The Portrait of a Lady’ is an adaptation of Henry James’s classic novel of the same name. It tells the story of a beautiful, free-thinking and intelligent young woman, Isabel Archer (Nicole Kidman) who arrives to England from the US with her aunt, Mrs. Touchett, to “see and explore the world”. While on her quest, Miss Archer rejects promising marriage proposals coming from a wealthy American tradesman, Caspar Goodwood (Viggo Mortensen), and an immensely rich heir, Lord Warburton (Richard E. Grant). Miss Archer takes these decisions because she is devoted to the ideals of personal freedom and a ceaseless pursuit of knowledge.Through the help of her faithful, but fragile cousin, Ralph (Martin Donovan), Isabel is made rich, and is then free to pursue her dreams of independence. However, when Isabel strikes up friendship with amiable and cultured Madame Merle (Barbara Hershey), she is far from suspecting that this acquaintance will lead to her unhappy marriage to an elusive, middle-aged art collector, Gilbert Osmond (John Malkovich). 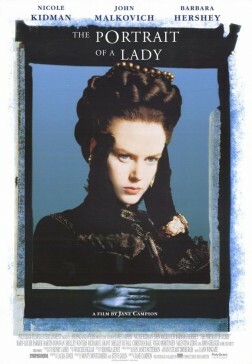 ‘The Portrait of a Lady’ is a beautiful picture: nicely photographed with a good use of locations. The film’s soundtrack, e.g. outstanding pieces composed by Schubert, conveys subtlety and beauty. Nicole Kidman performs well as Isabel Archer, a free-spirited woman who is determined to lead a life unconventional for a woman at that time. Barbara Hershey also gives a great performance as Madame Merle. She manages a very convincing portrayal of a kind and cultured woman who labours dark secrets, and was, in fact, nominated for a “Best Supporting Actress” Academy Award in 1997 for this role. However, Laura Jones’s script to this film makes one wonder. Jones had previously written film scripts to ‘Oscar and Lucinda’ (1997) and ‘Possession’ (2002), and both of these movies are known for their extraordinary length and uneventful plot lines. However, these are not even the main problems with ‘The Portrait of a Lady’. It seems that Jones had decided to ignore the first half of Henry James’s novel completely. The first part portrays the early intellectual and spiritual development of Isabel, interesting parts in the book which shed light on Isabel’s future decision-making abilities. So, the film starts off with Lord Warburton making a marriage proposal to Isabel – an event which does not happen until at least half-way through the novel. And even if we ignore that, the film makes little attempt to show thought-processes or emotions of the characters, or even provide some thought-provoking elements to the story, which the book does successfully on nearly every page. It may be very difficult to convey to the screen all the thoughts and feelings of the characters, a well as their complex, evolving relationships, but surely it is unpardonable to march out with a movie having so little understanding of the book’s point and the psychology behind each character’s actions. Half-way through the film, the audience is presented with the the main twist or “mystery” in the novel, making it virtually pointless to continue watching the film from then on. And, if that was not enough, the film continues to omit vital and interesting scenes from book as it goes along, although it does make effort to stay faithful to the book’s major events and dialogues. Some of the film’s problems are due to the miscasting of the main characters. Nicole Kidman does not make a “bad” Isabel Archer; it is just that she does not make a “true” one. In the book, Isabel is a fun-loving, curious and easy-going person. Although Kidman manages to convey the serious, strong and intellectual sides of the character, she does not succeed in presenting Isabel as truly kind, caring, thoughtful or easy-going. Kidman’s Isabel comes across as a forceful, impatient and even quite cunning individual. From the very first scenes, Kidman’s Isabel is like a ferocious dog set loose and this inner aggression is felt throughout the movie. In that way, Kidman completely misrepresents Isabel. However, it is the casts of Lord Warburton and Caspar Goodwood that really surprise. Lord Warburton is supposed to be the very ideal of every young woman’s fantasy: young, tall, immensely handsome, intelligent and rich. The drama of the story is that Isabel rejects someone so perfect for her dream of freedom and independence. The casting of Richard E. Grant, who looks like he can be Isabel’s father, is not the cleverest of ways to show that. If anything, Grant should have been cast as wealthy industrious Mr. Goodwood and let young and good-looking Viggo Mortensen play the role of the handsome English Lord. The point of the whole story by Henry James can be conveyed in these words: “danger concealed behind charm and benevolence”. Taking this into account, casting Malkovich as Gilbert Osmond is surely overdoing it completely. Malkovich as Osmond is too obviously menacing and despotic, even when he meets Isabel for the first time. He is like a violent Duke from ‘The Duchess’ (2008). Although Osmond is supposed to be strict in his manner, controlling and emotionally empty, he is also portrayed as very likeable and good-looking in the novel, and not half as “evil” as the film sets him out to be. Overall, it seems that ‘The Portrait of a Lady’ presents its audience only with the stereotypes or caricatures of the characters in the book by Henry James. Perhaps, only Martin Donovan provided a “spot-on” portrayal of his character, Ralph. Donovan seems to be perfectly cast and, in a way, appears even more interesting that Isabel. His character is an intelligent, humble and faithful friend of the main heroine, who instantly sees all the potential that there is in her, and stays true to her inner adventurous spirit, despite all the radical changes which her marriage produced. Christian Bale as Edward Rosier, a suitor of Pansy, Osmond’s daughter, does not show more than he already had in ‘Little Women’ (1994), but, nevertheless, portrays a disillusioned lover convincingly. I agree with your assessment completely. Awesome review!